Hello, friends! I’m bringing you an overnight oats recipe today. Are you familiar with overnight oats? 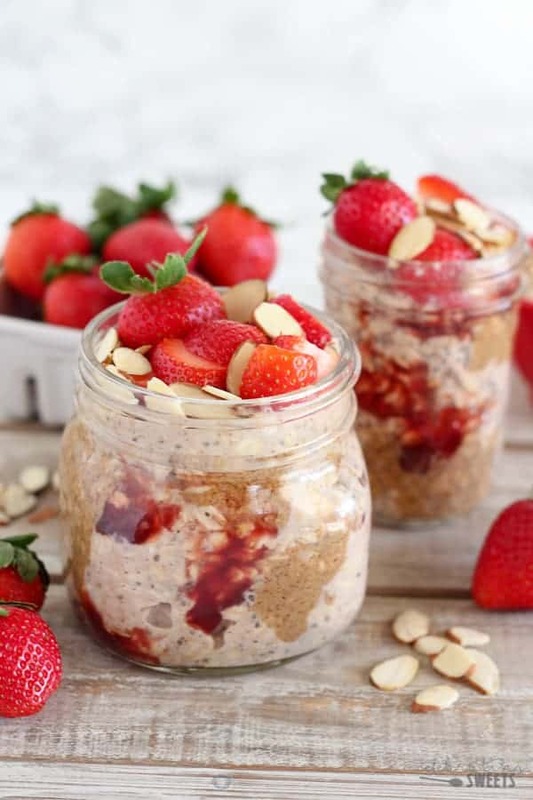 Overnight oats are made by soaking oats with milk, refrigerating the mixture overnight, and consuming straight from the fridge in the morning. Think it sounds delicious? Keep reading! Think it sounds unappetizing? I did too. BUT, I changed my mind, and you will too – keep reading! So, yes, to be completely honest with you, for the longest time I could not get on board with the idea of eating cold oats that had been sitting in the fridge overnight. But then, I actually tried it and it’s waaaaaaay better than I expected it to be. Plus, I realized I didn’t have to eat them cold (duh), I just warm the jar of oats in the microwave right before eating. It’s like having a bowl of creamy and flavorful oatmeal, but no cooking is involved. Zero. Zip. Zilch. I’m all about the no-cook these days. The temperatures in Arizona have been brutal. Every summer I question why we live here, but just when I think I can’t stand the 100° temps any longer, autumn magically appears. 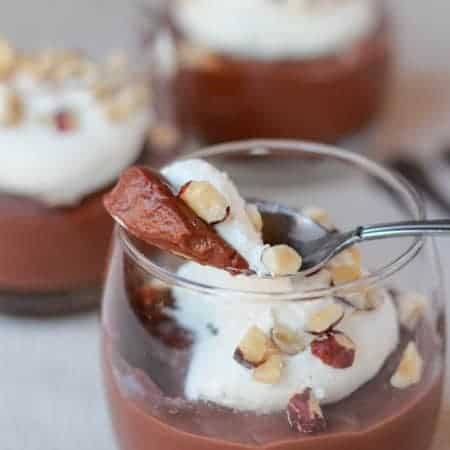 I’ve learned that in order to make it through the summer I need to rely on no-cook recipes and lots of frozen treats (Coffee Toffee Ice Cream or Berry Swirl Frozen Yogurt Bark, anyone?). This oatmeal has been a go-to for my family lately. I double or triple the recipe below and I fill individual jars with it. In the morning all I do is warm them up in the microwave and add a splash of milk. I hope you enjoy this healthy and hearty breakfast as much as we have. 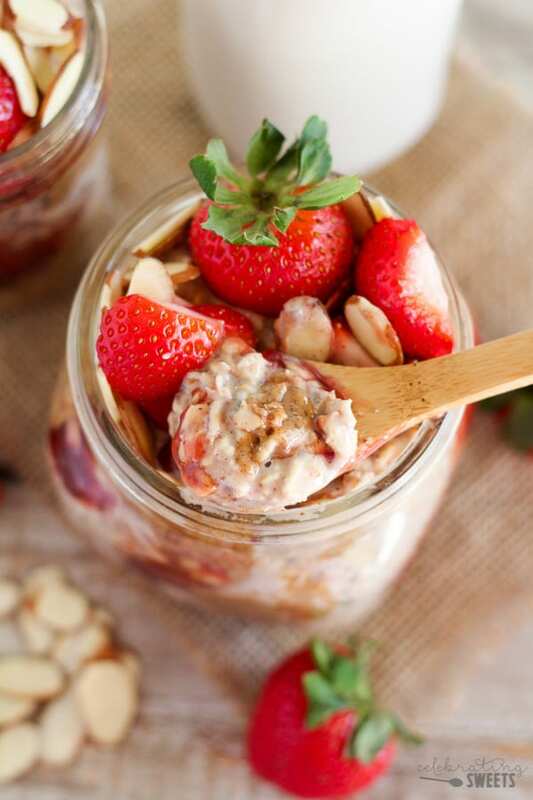 A recipe for creamy overnight oats flavored with almonds and strawberries. This healthy make-ahead breakfast is great for busy mornings. In a jar or bowl, combine oats, almond milk, chia seeds, jam, and honey. Stir until well combined and all the oats are covered in liquid. Cover and refrigerate overnight. For serving: warm oats in the microwave, if desired. Add almond butter and little more jam and stir just slightly so that you can see the swirls. 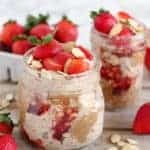 Top with sliced almonds and strawberries. I can’t wait to try these. They look heavenly! I pinned immediately! Hi, how well would these n other ooiaj would keep in freezer. My boss tried one of mines w coconut, choc chips, oats n bananas n she wants me to make her 12 for her to freeze n est them as ice cream.. She wants to pay me, lol. I have never frozen them before. I don’t think it would be very tasty, but you’re welcome to give it a shot! This looks delicious. I love strawberries. 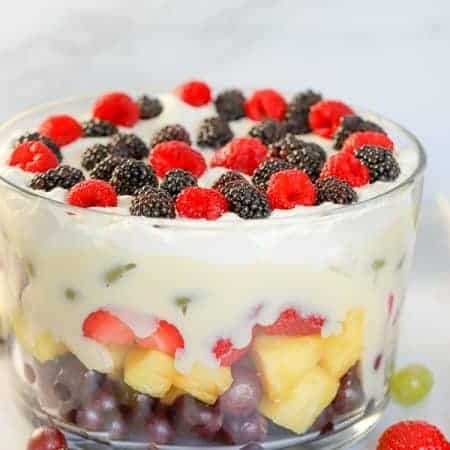 Yummmmmmm, this looks AMAZING!!! 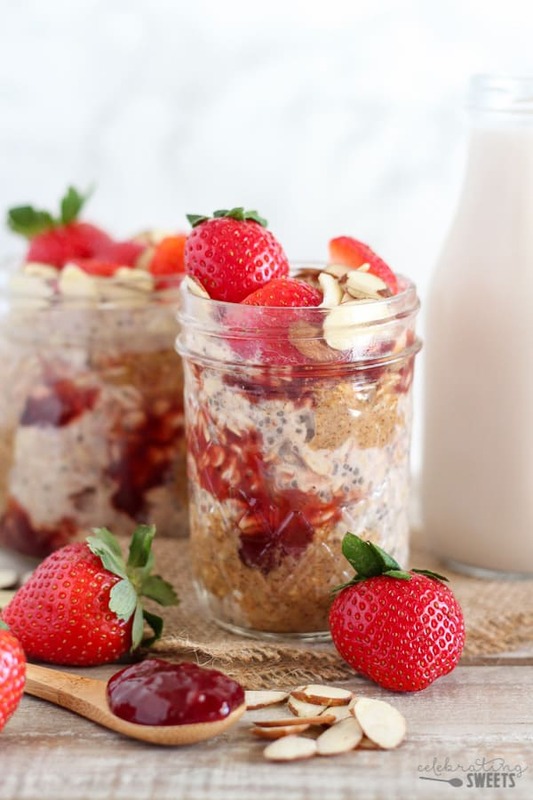 I’ve never tried overnight oats, but I think I’m going to have to jump on board!! YUMMMM. 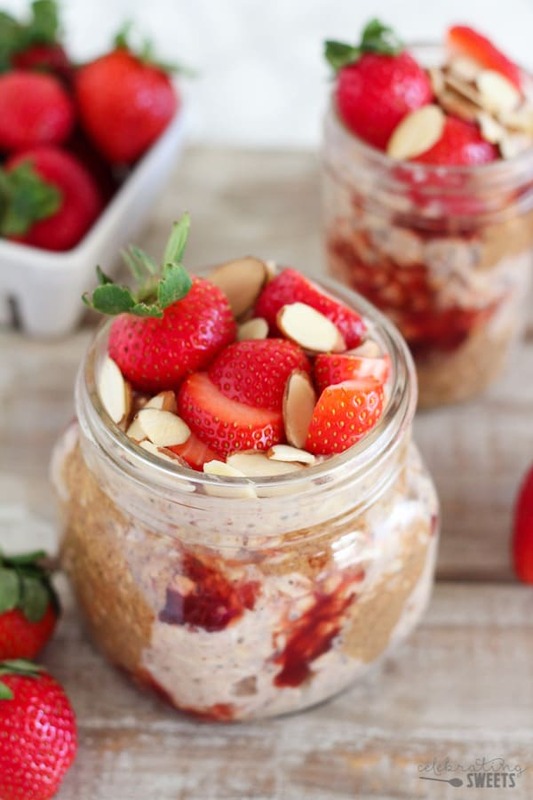 I love overnight oats and these look soooo good! Definitely going to give them a try. These 100 degree days are killing me too. I need all the non_cooked goodies I can get. 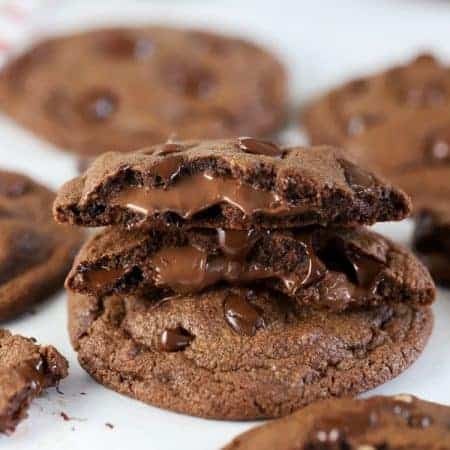 These look absolutely heavenly! Craving this! Love everything about this.